Thanks to a timely and thought-provoking reminder from Adam at Infantile Disorder, I didn’t miss the twentieth anniversary of the release of Pearl Jam’s Ten. And while it is never easy to realise that the soundtrack to those once-so-heartfelt teenage rebellions is drifting towards the status of golden oldie, still I am glad to be able to mark the occasion. At the time, I seem to remember the grunge scene being derided as not political enough, far too self-absorbed, the product of a generation so dulled by therapy that it could do little more than whine. All quite possibly true. Yet the music was also a perfect expression of the unsettling fear that life wasn’t quite turning out to be all it should have been. The Cold War was won, the upward trajectory was assured, but it didn’t feel all that great, instead there seemed to be little cause for optimism as the end of the century also loomed. Like Jarvis Cocker, both Kurt Cobain and Eddie Vedder were clever kids, out of place at school and home and wearing their differences heavily. The so-called ‘cool’ kids at my school hated Pearl Jam and Nirvana, while the rest of us probably loved them even more because of it. These bands offered a way out of everyday thinking, an escape from cultural cul-de-sacs and seemed the best chance for victory over the forces of ordinary, at least until Kurt turned the anger inwards, like Jeremy in Pearl Jam’s song. Thanks for setting me right AD. You might not believe it, but by the time they made it to this side of the Pond, even the Lemonheads were being sold to us as grunge! Those crazy label marketing guys, eh? Ah but yeah but they were FALSE GRUNGE because actually Mudhoney invented it but actually no because even they said they didn’t… well, anyway. ‘Making teenagers depressed is like shooting fish in a barrel’, as Bart Simpson noted. It wasn’t about ‘angst and foreboding’ where we were from (North Yorkshire), it was making a colossal racket. Full timeline/exposition to follow shortly in the Mortal Bath! I could never get into the Nirvana/Pearl Jam schism some pals did. 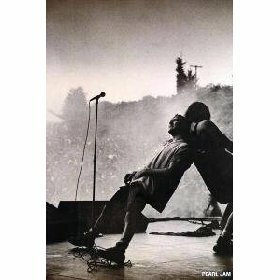 Pearl Jam were a nice rock n roll band. Saw them a few times. State of love & trust! One of my fave recollections of the era was Christmas 1991. Michael Jackson’s ‘Bad’ was #1 in the US on the day. By New Year’s Eve, Bad had dropped down the charts and Nevermind was #1: conventional wisdom was that all the kids exchanged the former for the latter and that a sea change in American music had taken place within the space of a week! Been listening to Ten today… Soundgarden next I reckon. Nirvana was the first band me and my Dad fell out over. Before that, we’d pretty much shared the same tastes in music, but it was one of those inter-generational lines in the sand, there was no crossing it!